Have you thought about your nutritition plan? BBC Good Food Healthy Recipes also have an app on the App store now which makes it even more convenient. So why is it important you take the time to enjoy the food your eating? Boring diets, with repetitive and flavourless food are more like to end in a failed diet than those that have flavour and variety. You have to think about what you fancy, you will normally have to prepare the night before and the best thing about this is that you can have an indian less all the fat and additives for only 300 calories!! Result. Let me share with you some of the top healthy recipes that I have tried and tested. Salmon Burgers are great for grilling, barbequing or oven cooking. Salmon is high in essential fatty acids and is great for getting some protein. Enjoy these salmon burgers with some salad and a small amount of wholemeal Rice. Meanwhile, use a swivel peeler to peel strips of carrot and cucumber into a bowl. Toss with the vinegar and sugar until the sugar has dissolved, then toss through the coriander leaves. Divide the salad between 4 plates. Get a Taste of The Mediterranean with this amazing Paella Style Dish. I absolutely adore this dish, I tend to have it on the rare occasion due to high carbohydrate content. But if you have really worked hard all week and fancy a bit more of an indulgent meal. Try this one, absoloutely delicious and only 7g of fat. TIP If you don’t want to spend time at the stove you can bake this dish in the oven. Tip the onion, peppers, chorizo, garlic and oil into an ovenproof dish, then bake for 15 mins at 200C/180C fan/ gas 6. Stir in rice, tomatoes and water, cover, then bake for another 20 mins, stirring in prawns for the final 2 mins. 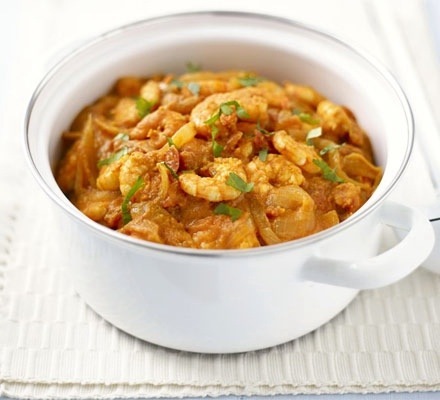 This prawn curry is absoloutly delicious that when you eat it you can not believe how low in fat it is and easy to make. Heat the oil in a medium saucepan. Tip in the onion and ginger, then cook for a few mins until softened. Stir in the curry paste, then cook for 1 min more. Pour over the chopped tomatoes and coconut cream. Bring to the boil, then leave to simmer for 5 mins, adding a little boiling water if the mixture gets too thick. Tip in the prawns, then cook for 5-10 mins more, depending on how large they are. Serve alongside some wholemeal rice and sprinkle with a little chopped coriander, if you like. 2) This is my favourite and easiest dish to cook and you don’t even need a recipe. 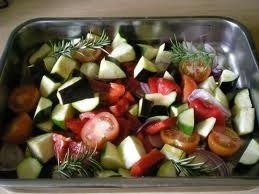 Layer an oven proof dish with vegetables all chopped, the drizzle with olive oil, and sprinkle with garlic. Then rub paprika on the chicken and olive oil thats left. Then put the 2 chicken breasts on top of the vegetables. Add Lea & Perrins and then cover with kitchen foil. Add to oven and cook for 1 hour 15 minutes. Heat oil in pan and Cook the chicken for 4 minutes and then add the onion. Once the onion is browned add the peppers and add the Ol Des Paso spices. 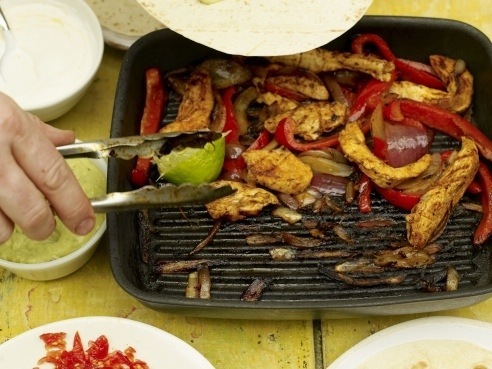 Cook for about 5 minutes, while heating your tortilla wraps in the microwave for 1 minute so they are nice a warm. Then voila an extremely scrumptious and tasty meal, low in fat and only 250 calories. Hope this is useful for you and will give you all some inspiration in your cooking.